Jump ToThe Empire Strikes! 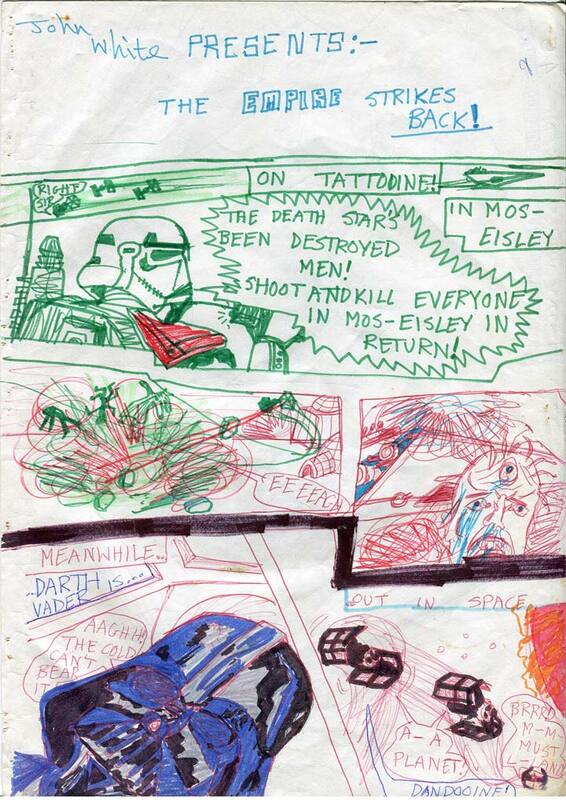 Front Cover01: "Kill Everyone in Mos Eisley! "02: Darth is Attacked by a Beast in the Jungle!03: "Imperial Cruisers—hundreds of them! "04: The Destroyers Suddenly leave—but why?05: "Chewie—oh my God! "06: "The Wookiee's alive! "07: Jet-Pack Stormtroopers Attack!08: Oops! A Rebel Laser Ricochets and Destroys Four X-Wings!09: "Get them before they get you! "10: "We're coming out of hyperspace!" (with uninvited guests)11: "Every droid must be destroyed! "12: Imperials kill the Rebel Prisoners13: A Plan Goes into Action!14: Giants and Mind-Control. What?15: "Don't touch that gun! "16: "Chewie—warp 90—fast! "17: "See ya in hell, kid! "18: Dengar—and Slave 1!19: "You may fire when ready, bounty hunting scum." 1978 or ’79 | age 10 or 11 The sequel picks up immediately after the first film ‘Star Wars’, with: Vader tumbling through space, and a ruthless Mos Eisley massacre. What a sweet child was! And not for the first time. This is post August 1978, because the title of the new film was officially released on August 4th 1978. 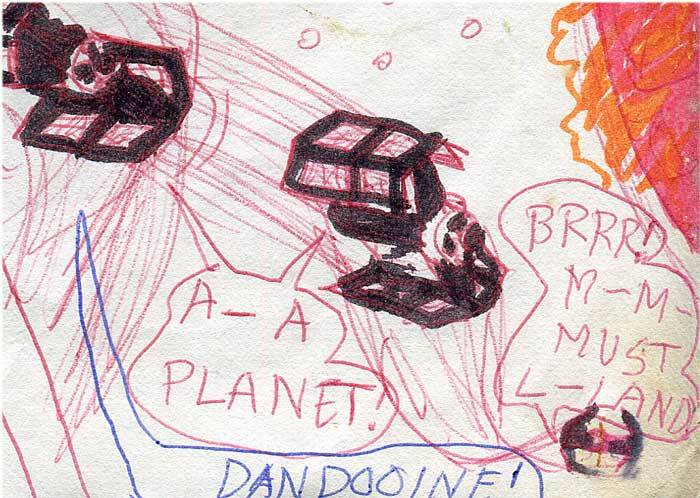 I pulled no punches with drawn violence when I was a kid. The massacre shown here, would have been inspired by the sort of thing I’d seen in Warlord comic. It was pretty common in that 1970s comic, for German SS troops to demand from the citizens of a pretty occupied hill village, the names of the local partisan saboteurs—or else. The villagers would say nothing and the firing squads would start their work. Not content have the innocent population executed by Stormtroopers—or even TIE Fighters, I get a Star Destroyer in on the act too. I wouldn’t want to be a Stormie standing around when that happened. It’s interesting that I supposed that Darth’s TIE Fighter, now without any power, would have dropped to sub-zero temperatures inside. He goes “Brrr!” Aw bless him. He should have worn a jumper and thermal socks under his evil outfit! I named the planet Dandooine. Was that because Leia suggested Dantooine to Tarkin as the rebel base location? (She must have thought it was an unimportant s**thole) I changed just 1 letter. Of course, we’ve seen in SWa9 that it’s not unusual for me to have misspelled things. I wonder why I drew it in red biro and green markers? 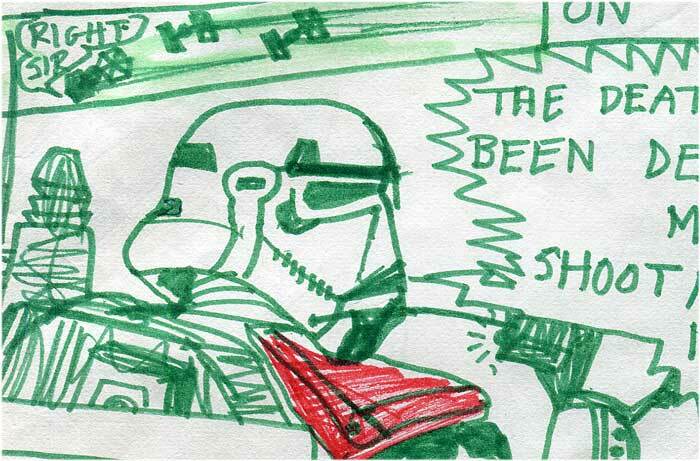 I suspect I drew it crudely in green markers, and later added the more precise red ballpoint pen. This was stapled to the back, in blue biro. It’s the final Throne Room Medal Ceremony scene from ‘Star Wars’. 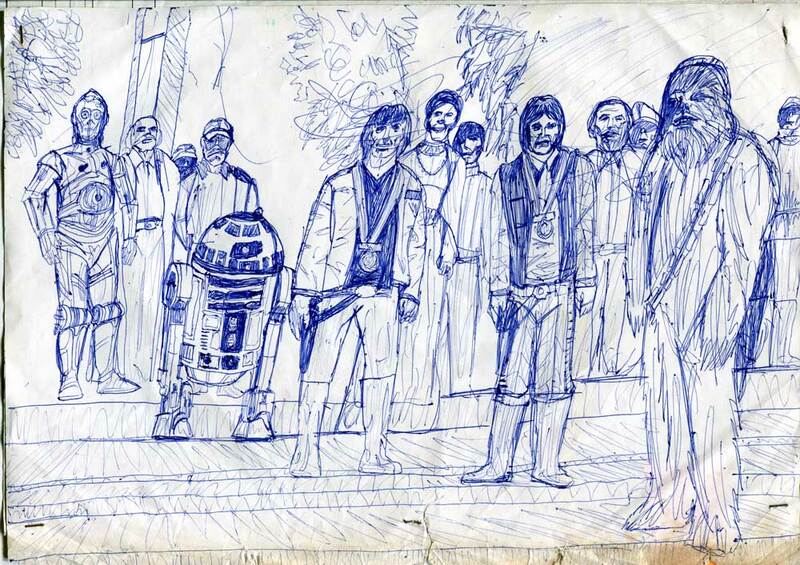 Drawn by an older hand, perhaps around 1980? I suppose it’s meant to act as a bridge between ‘Star Wars’ and my sequel. I’ll be delighted if you’d leave a comment below. I read them all!